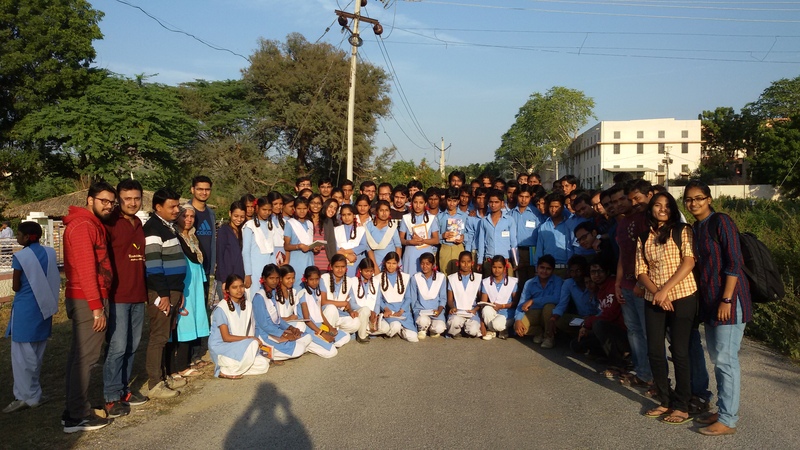 Prayatna – The Social Responsibility Club of IIM Udaipur with its ‘Campus Connect’ program has made a small, sincere effort to create a platform required to bring in the social change. 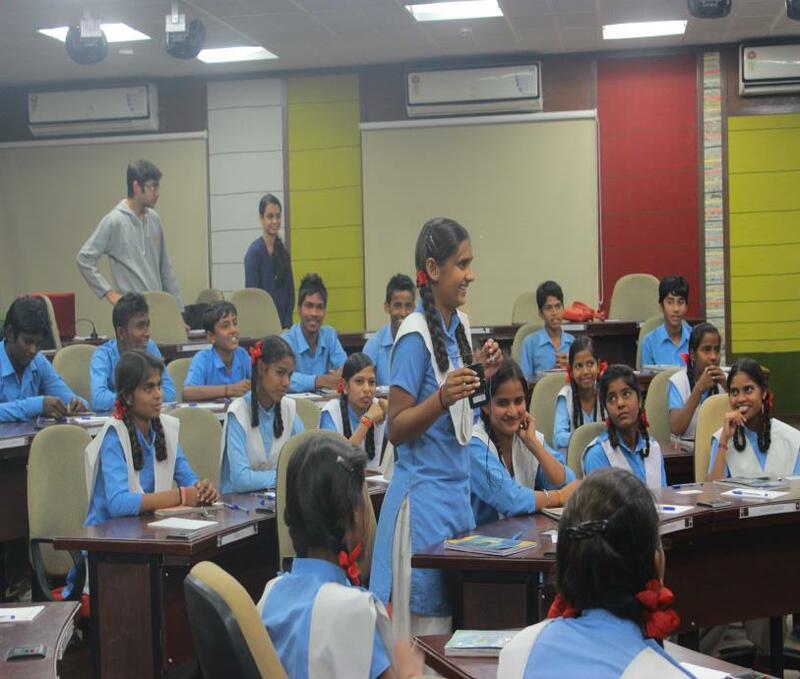 The latest Campus connect initiative saw students of Government Senior Secondary School, Balicha, Udaipur interact with IIM Udaipur students. The mission of the program is to instill confidence and help students DREAM BIG!!! The motive was to set a platform where students could connect, interact, and be part of the mentorship program. 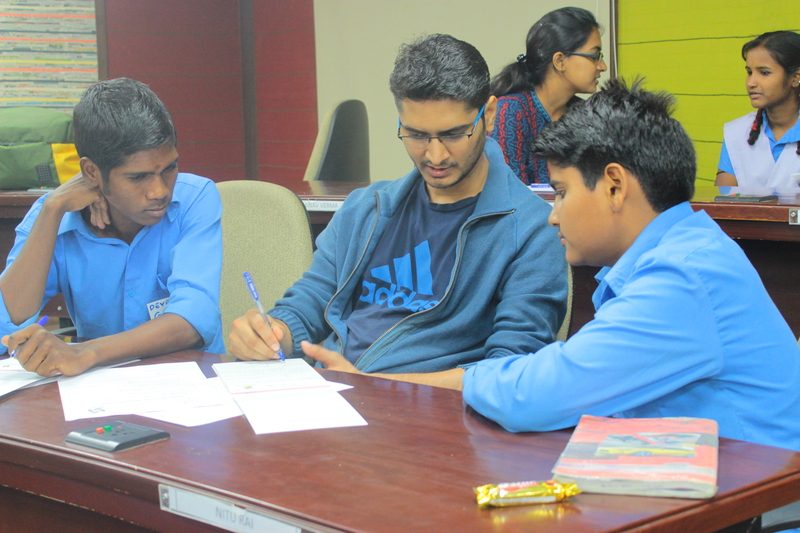 The program is unique in itself as students are in constant touch with their mentors (Students of IIM Udaipur), who motivate, guide, and help their mentees understand their liking/disliking, share information and experience which in some way or the other guides the students to achieve their short and long term goals. These goals are not restricted to engineering or MBA, and are related to any of the future avenues which the student holds dear or is interested in. Prayatna expects this would bring in the positive change and would create sustainable and life-changing experience for the individuals involved. The day constituted of fun-filled events. It began with an ice-breaking Creative Paper Art session where the students (20 Girls and 27 Boys) were first asked to showcase their skills with a pen and paper. The activity was enjoyed by all the students and many of them were rewarded for their beautiful art. Thereafter, students were given a chance to speak about self and their aspirations, for 2 minutes. The intention was to make them feel comfortable and to build confidence. Most of the students came up with bright aspirations; one of them wanted to become an engineer, another, doctor, a few wanted to join the Indian Army and some wanted to get into the Civil Services. 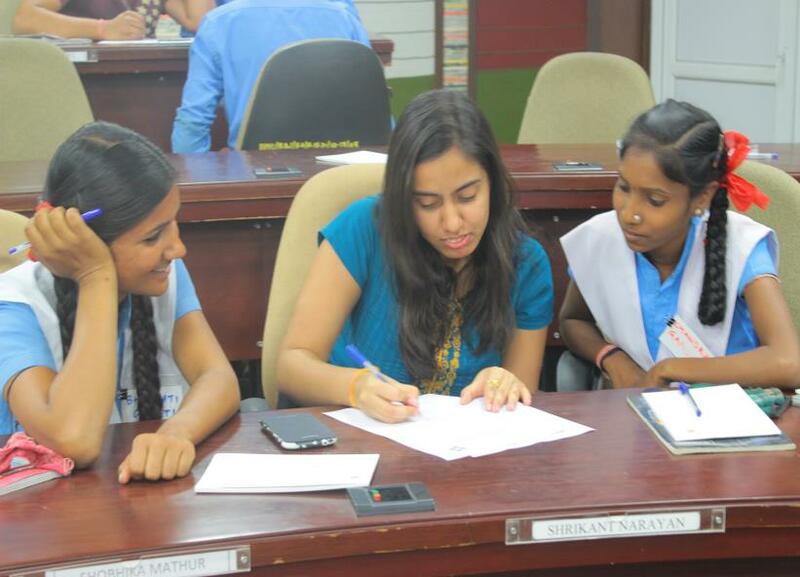 Going ahead in the day, a quiz session was organized for the students. Questions asked were related to the monuments, lakes, forts of Udaipur. The participation was overwhelming as the moment the question appeared on the presentation-slide, all of the hands rose to answer. They were delighted to receive chocolates and goodies as rewards. The session also included sessions on Importance of Education and Life after School with the intention to educate students of their career opportunities and the assistance that our institute can provide. Motivational videos highlighting the importance of hard work and overcoming obstacle, were shared with the young minds to motivate them to think “BIG” and reach the pinnacle of success. Proceeding to the last event of the day, each mentor accompanied his/her assigned mentee for refreshment. The idea was to make mentee comfortable to interact with their assigned mentor, interact on a one-to-one basis, and discover things about each other. The mentors-mentees jelled well in a short span of time and exchanged their phone numbers, email ids and a schedule set for themselves to converse with each other over every weekend. The constant support from Student affairs Manager Joel Xavier and the Admin team enables the student community to organize such events with freedom and success. The commitment from all the mentors towards this noble cause and sharing their valuable knowledge with the students is praiseworthy and raises the hope that contribution would bring a worthwhile impact to the lives of the young capable minds. Akshat Verma, Dhamne Kunal, Ishant Saini, Kumar Vimal, Meghana, Sreeparna Das, Tushar Gogia from 1st year and Sitanshu Upadhyay and Kumar Kaushal from 2nd Year. The closing heartfelt remarks from the organizers of the event – Deepanshu Malhotra (1st Year) and Kodavali Lavanya (1st Year) that the “Event was Satisfying” reflects the success of the event. Things which differentiate IIM Udaipur – Values! Treading the path of management career empowers one with a responsibility to create social and economic values for the society. A large part of the managers’ careers involves real time complex decision making in testing and demanding situations and the decisions affect organizations, citizens, communities and the environment. The pedagogy at IIMU is designed keeping the ideaor in mind to develop sensitized and responsible managers instilled with values which will help them in every stage of their lives. Convened by the visionary leader, Prof. Janat Shah – Director, IIM Udaipur, who is known for his humbleness and modesty in the academic & corporate world and the Board of Governors, the initiatives operational at IIMU foster values in all the actions and commitments of students, faculty and staff. The programmes are specially designed to hone the values of integrity, honesty, respect, ownership, trust and excellence in all the deeds of student managers. The institute administration working round the clock in running the activities of the institute surpass excellence and exemplify a culture of always being approachable, dedicated and helping. The faculty and students work in teams in a multi-cultural and academically diverse setting to develop authorship, respect, understanding, reliability and appreciation of the values of team work. Provision of Global and Rural Immersion programmes coupled with socially oriented courses like Business Ethics in the curriculum help in the all-round development of students. IIM Udaipur is the only institute in India to have a Code of Conduct and Constitution in place within just two years of its foundation. Each and every word in the constitution has been debated in open house sessions between the students and the administration to ensure there is upright integrity in academic and non-academic pursuits of the students. A Council of Student Affairs is elected by the students, which works towards protecting the rights and duties of the students and to ensure there is openness and fairness in the access of growth opportunities and learning resources of the institute by all. The institute has adopted practices and standards like IPRS audited placement reports, sharing of institute events’ reports with the community and timely communication of admission process which reflect transparency and accountability. The events of the institute are organized and implemented by the students and the student clubs and committees are given full autonomy to design and control their governance. A number of activities are designed in collaboration with external agencies and organizations like NGOs and government bodies wherein the students strive towards learning social responsibility, inclusiveness and the potential of collective growth. The endeavor of the institute and its affairs remain a testimony to the sincerity, leadership, uniqueness, creativity, mutual prosperity, equality, sustainability and decorum in communication aligned with the student activities to help them stand out at the helm of their careers and achieve their goals of success with élan in the competitive business world. Second Annual Convocation of IIM Udaipur - Memoirs of the Batches! 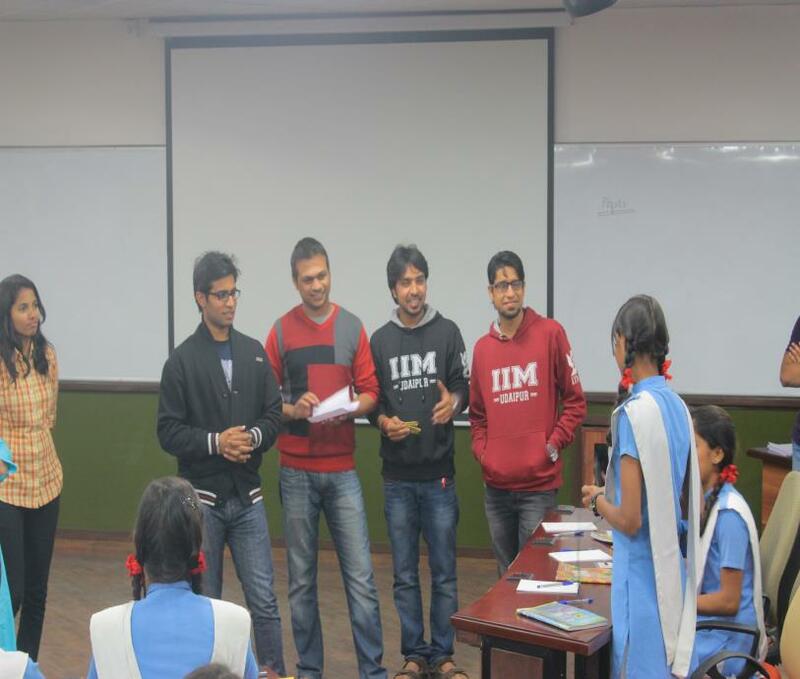 AUDACITY 2015 IIMU's first cultural extravaganza ! !